It looks like recent information regarding Alien: Awakening may have been overstated a bit. 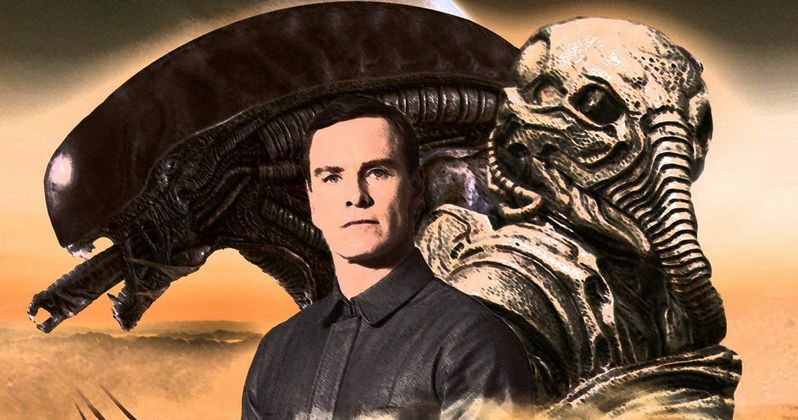 We reported on some plot details contained in the alleged script for the planned follow-up to last year's Alien: Covenant, which would round out the prequel trilogy that Ridley Scott started with Prometheus back in 2012. However, according to a new report, that script doesn't even exist. At least not yet. Unfortunately, for the time being, Ridley Scott and Fox are staying quiet, so this information needs to be treated with the appropriate amount of skepticism. That said, a new report states that John Logan, who had been tapped to write Alien: Awakening, hasn't actually written the movie yet. It's certainly possible that he and Scott have tossed some ideas back and forth and that they even have a treatment, but according to "a source who's certainly in a position to know," no screenplay for the movie currently exists. That means some of those very appetizing plot details we heard recently aren't set in stone. And not to mention that this project isn't terribly likely to happen in the first place, at least not in the near future. What we recently heard is that Alien: Awakening would return to the planet LV-426, the world featured in the original Alien where Ripley and the other unfortunate souls of the Nostromo discover the Xenomorphs. It was also reported that the Engineers, first seen in Prometheus and later all-but-extinguished by David (Michael Fassbender) in Covenant, will return. Apparently, several Engineers survived the genocide and they're going to be chasing David, who took control of the Covenant ship at the end of the movie and it's crew. Ultimately, that chase leads them back to where it all began, tying the prequel trilogy to the original movies. As appealing as that all may seem, it was apparently a bit premature. Let's not forget that some concept art was shared online for a much earlier version of what became Alien: Covenant that looked a lot more like Prometheus 2 before the story settled into what we saw last year. It's quite possible that if John Logan, or whoever the job falls to, winds up writing the script, things could change. It's also worth mentioning that when Covenant failed to meet expectations last year, bringing in just $240 million worldwide working from a $97 million budget, Fox hesitated to pull the trigger on another installment. In the time since, the Disney merger has loomed large, with the Mouse House set to take control of the franchise sometime next year once the deal is complete. Another interesting note in this report; it states that things "definitely are" happening behind the scenes with the franchise, despite the fact that Alien: Awakening doesn't even have a script. To that point, we have heard rumblings of a possible TV series set within the Alien universe. It's also possible that someone, be it Fox or Disney, will decide to let Ridley Scott finish out his trilogy and give this movie the green light in the future. It's just even further from reality than we thought previously. This news originated over at Birth.Movies.Death.